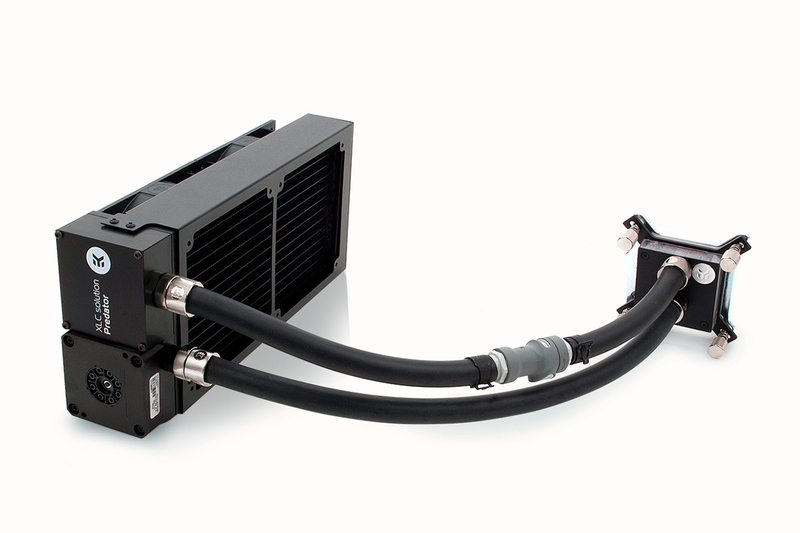 EK Water Blocks, premium PC liquid cooling gear manufacturer from Slovenia, is proud to expand the XLC Predator lineup, premium liquid cooling all-in-one (AIO) family of CPU coolers! By a popular demand the EK-XLC Predator 240 is now also available with QDC! Along with the newest addition to the Predator family, every model is now upgraded to Revision 1.1 which brings updated CPU mounting mechanism, allowing greater CPU socket compatibility and even easier installation process! Since the launch of the Predator lineup, there was a huge demand for the EK-XLC Predator 240 with Quick Disconnects. EK listened to the community and is releasing the product today – with pre-filled GPU water blocks, readily available for purchase, gamers and enthusiasts can now build a complete liquid cooling system, including their CPU and GPU in the same loop! EK-XLC Predator 240 (incl. QDC) is a premium grade pre-filled and pre-assembled all-in-one (AIO) CPU liquid cooling unit. 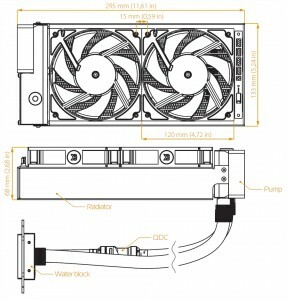 It utilizes top-tier EK-Vardar high-static pressure fans and market-proven Laing DDC liquid cooling pump. All-around PWM control provides minimal noise profile and performance on demand. Predator utilizes industry standard G1/4 threaded ports and 15,9/9,5mm (5/8″/3/8″) Zero Maintenance rubber tubing (EK-ZMT). Like its predecessors, it is fully expandable and customizable with all custom-loop liquid cooling gear available in EK’s portfolio. The newest Predator family member now features Quick Disconnect or QDC, which was previously available only with the 360 version. 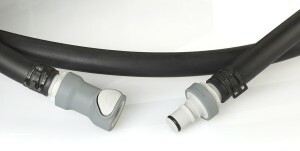 Manufactured by renown Colder Products Company (CPC), this special medical-grade connector allows quick and tool-less expansion of the system without the need for draining of the unit. This allows users to add a pre-filled and QDC-enabled GPU water blocks which can be purchased separately through an EK web shop! The expansion of the system can be very quick, easy and safe. We have tested the Predator 240 under extreme conditions, with Intel® Core® i7 5960X (2011-3 socket) running at 4.0 GHz (1.20V) and overclocked NVIDIA® Titan X. The graphics card was connected using QDC and under full load, the system was dissipating a whopping 550W of heat! In the graph below you can see the thermal results at the different fan speeds. HovercoreTM is a revolutionary design of radiator de-coupling that effectively prevents transfer of pump induced vibrations from the unit to the computer chassis itself, thus resulting in vibration-free and silent operation. CoolStreamTM PE 240mm radiator, has a full copper core superior to aluminum alternatives in terms of heat dissipation. In conjunction with EK-Vardar fans the result is increased performance across an entire fan operational range, thus delivering results both at low- and high airflow operation. Dimensions of the main radiator unit on Predator 360, with integrated pump and reservoir are: 295 x 133 x 68 mm. This allows mounting of the unit in most modern mid- and full-tower computer cases. All EK-XLC Predator models are now upgraded to Revision 1.1. The new revision features completely new CPU mounting mechanism which makes the installation of the EK-Supremacy MX CPU water block much easier and improves CPU socket compatibility option! There is also no need for EK-XLC Predator LGA-2011 Screw Set (SKU 3831109800348) since all supported socket screws are now available out of the box! EK-XLC Predator 240 (incl.QDC) is fully compatible with Intel LGA-115x and LGA-2011(-3) CPU sockets. EK has provided a set of Installation Guides to help beginners set up their first liquid cooling loop. Made in Slovenia, Europe, the unit is readily available through EK Webshop and Partner Reseller Network. In the table below you can find MSR price with VAT included.